In 12 remarkable months, Kayla Gaytan has become a cancer survivor, a mom of spontaneous quadruplets and a cancer patient all over again. 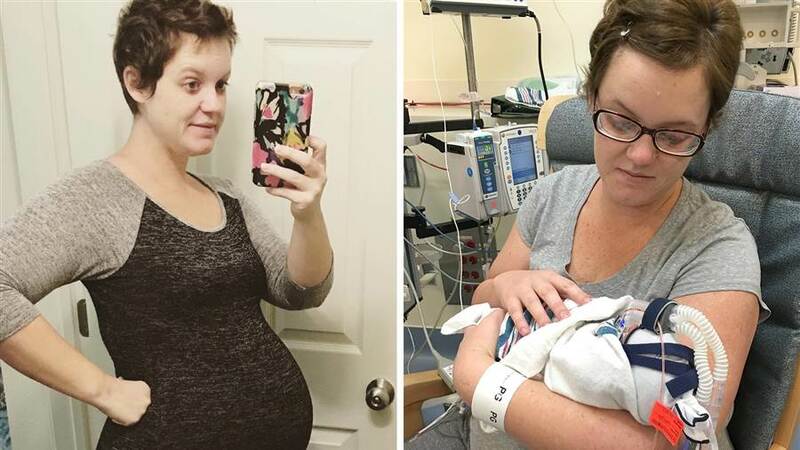 Diagnosed with Hodgkin’s lymphoma six days before her 29th birthday and a week after her wedding in January 2016, she gave birth to her four babies last month. Now Kayla is getting ready for the fight of her life. “It’s a little overwhelming, I’m not going to lie. Honestly, I just take it day by day,” Kayla told TODAY. Kayla and her husband Charles, a soldier stationed in Fort Campbell, Kentucky, were already the parents of two children when Kayla began to complain of a persistent itch — one of the possible symptoms of Hodgkin’s lymphoma. She was misdiagnosed for a year and a half, but kept listening to her body and consulting doctors, she said. When Kayla went to the emergency room for a stubborn cough, a chest X-ray revealed tumors that took up a third of her chest cavity. She also had enlarged lymph nodes. Hodgkin’s lymphoma, also known as Hodgkin disease, is a cancer of the lymph system. Kayla underwent “gruesome” chemotherapy, getting infusions every other week for five months, her husband wrote on the couple’s GoFundMe page. The treatment appeared to be successful and she went into remission in June. Then something amazing happened. She found out she was expecting spontaneous quadruplets — conceived without the help of fertility drugs or other medical intervention. Kayla’s goal was to carry the quadruplets for 34 weeks before a C-section. The pregnancy went smoothly; the babies all grew and progressed well. Then, Kayla started itching again and noticed her lymph nodes “popping up” like before. A biopsy in November revealed the Hodgkin’s lymphoma had come back. It meant more chemotherapy. But first, she'd have to have the C-section. “My body was telling me that I needed to start treatment sooner, so we ended up taking (the babies) out at 30 weeks,” Kayla said. The quadruplets were delivered at Vanderbilt University Medical Center in Nashville, Tennessee, on Dec. 30. The quads — Charles, Michael, Victoria, and Lillian — ranged in weight from 2 pounds, 8 ounces, up to 3 pounds, 2 ounces. They’re healthy, although Victoria and Charles have some issues with their lungs and are on ventilators — but improving daily, Kayla said. All four will likely stay in the NICU until February. Since the cancer returned, scans have revealed tumors in her chest, arm pit, and neck area. She starts chemotherapy on Jan. 18 and will have to have a stem cell transplant, followed by 16 more months of chemotherapy. Doctors have told Kayla she has a 50 percent chance of surviving the next five years. “Hopefully, I can beat those odds,” she said, sounding upbeat. “It would be so easy for me to go sit in a corner and cry all the time and be upset that all this is happening. But I think of my amazing family that I have and the support I have around me and that really helps me get through every day."